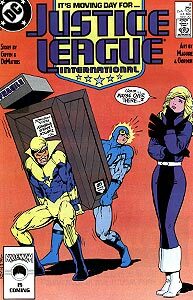 Cover Description: Booster Gold and Blue Beetle II strain to hold up a clearly heavy, up-side down package, while Black Canary II debates where it should be located. Brief Synopsis: The three international branches of the Justice League suffer through moving-day turmoil. Issue Summary: Despite television pundit Jack Ryder's objections, the new Justice League International is moving into their new embassies around the globe. Martian Manhunter discovers that the New York Embassy is structurally deficient while Captain Atom ruins Mister Miracles hard work on the defense systems. Batman supervises the defense installation in the Moscow Embassy and convinces the new liaison that bugging by the Soviet government will not be tolerated. 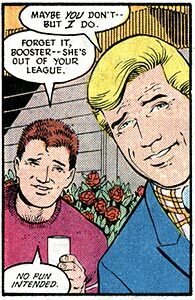 Booster Gold makes a fool of himself by hitting on Catherine Cobert, the liaison for the Paris Embassy. At the end of the day, Mister Miracle crashes the team's new shuttle through the roof of the New York Embassy. Issue Notes: First appearance of the JLI embassies in New York, Paris, and Moscow. FIRST APPEARANCE: First appearance of the New York JLI Embassy, occupied by Captain Atom, Martian Manhunter, Mister Miracle, and Oberon. Martian Manhunter reveals his affinity for Oreo cookies, a treat that he was introduced to by Captain Marvel. In more recent issues, Manhunter will prefer Chocos cookies, another brand name for the same style sandwich cookie. FIRST APPEARANCE: First appearance of the Moscow JLI Embassy, occupied by Batman, Guy Gardner, and Rocket Red #7. FIRST APPEARANCE: First appearance of Boris Dmitravich Razumihin, Bureau Chief for the Soviet Embassy. Booster is pleased to have returned to Paris, where he is enjoying wine in an outdoor cafe with Ted Kord, the Blue Beetle's alter ego. This is the first time the two heroes have come face-to-face on panel without their costumes on. Booster is a confident ladies man, while Beetle is more the sensitive type. Though Booster doesn't know it, he is about to make sexual advances on Catherine Cobert, the Paris JLI Embassy Chief, in her first appearance. She will shoot him down in 46 seconds (slapping him in the face, no less), Booster's first depicted rejection in over a year of super-heroing, a situation that has Beetle in stitches for pages to come. The next time that Cobert and Booster meet, he will be in costume and she will not immediately recognize him. FIRST APPEARANCE: First appearance of the Paris JLI Embassy, occupied by Black Canary, Blue Beetle, and Booster Gold. FIRST APPEARANCE: First appearance of Blue Beetle's signature "Bwah-ha-ha" laugh. At Booster Gold's expense, of course. FIRST APPEARANCE: First appearance of the new JLI shuttle, donated by S.T.A.R. Labs. The shuttle is a unique, red and white design, combining a saucer body with the tail of a jet and landing struts similar to chicken legs. Its means of propulsion is not revealed. Mister Miracle promptly destroys the roof of the NY Embassy by landing the heavy shuttle on it. The new JLI accepts its "first mission" to defeat "super-powered lunatics" in Bonn, Germany. At the time of this issue's publication, before the reunification of Germany following the collapse of the Berlin Wall, Bonn was the capital of West Germany. Though the current team has assembled before, in the pages of Booster Gold, Vol. 1, #22, this is their first international mission since moving into their embassies. Boosterrific Review: Man vs. Self? Man vs. Nature? Man vs. Man? No. Try Man vs. Building. This second issue of the newly-titled Justice League International spends most of its time setting the new international stage for the background of this new team. No doubt this establishment of setting is necessary, but it certainly lacks the action that most readers will expect in a super hero comic book. Great humor, great art, mediocre story. I think our host is being a bit harsh but yeah not much of a story here. This is a nice debut for Blue and Gold and their friendship. Great for Bootser but not as good for everything else despite a fun Guy and Bat in Moscow scene.